In order to understand how media broadcasting of Women’s World Cups has progressed, it is important to take a look at where we currently stand with regard to World Cup media coverage for women’s soccer. To do this we can look at the available statistics and facts from the most recent Women’s World Cup, which was hosted by Germany in 2011. This section provides a brief, but informative overview of everything one needs to know about media coverage of the 2011 World Cup. The 2011 FIFA Women’s World Cup held in Germany set new records as the percentage of people watching the games skyrocketed to unprecedented heights, surpassing previous television audience records for past women’s World Cups. This observed increase in viewership was particularly striking in Germany, the host country, as well as in Japan and the United States, which were the two finalist countries. In Germany, an average audience of over 14 million watched Germany’s four games, with over 16 million viewers for the final three games . Meanwhile, the United States saw over 14.1 million viewers during the final match between the U.S. and Japan, with the majority of the media coverage in the United States delivered by ESPN . ESPN reported to have had a peak audience of 21.1 million during the penalty shoot-out between Japan and the USA, setting new records for the highest-ever television audience for a soccer game in the U.S., and the second-highest audience ever for a daytime program in United States cable history . Also, despite the time difference and the fact that the final between the U.S. and Japan aired in the early hours of the morning, a record audience of 10.4 million watched the game in Japan, with a peak audience during the penalty shoot-out reaching almost 15 million . All in all, the 2011 Women’s World Cup, with a total global-in home television audience of more than 63 million people, saw a overall 5% increase worldwide in the percentage of viewership for the final match when compared to past Women’s World Cup championship games . These unprecedented viewership stats are clear indicators of the changing landscape of both women’s soccer coverage and popularity worldwide. It is interesting to note that during the 2011 Women’s World Cup, ESPN was the primary broadcaster of the matches and post-game coverage . However, this is not the case for the upcoming World Cup in Canada where FOX has already made a commitment to providing the majority of the media coverage on the games, players, and teams . Also, something else that is interesting to look at is that, in addition to increased average viewership stats in many countries, there was also a 9% increase in the percentage of people who tuned in for more than 20 minutes to watch the 2011 World Cup games . This number has been steadily rising over the years as more and more people watch the televised World Cup games for longer periods of time. The United States saw the largest percent increase in viewership of over 20 minutes with an almost 200% increase . This was due in part to the U.S. Women’s National Team making it to the championship game, but was also a result of television providers broadcasting games at more viewer friendly times . Notable increases in viewership were also observed in other countries who were neither the host country nor the finalists, such as Canada, Columbia, Peru, South Africa, Nigeria, and Mexico . Another noteworthy figure deals with the demographics of the viewers of the 2011 World Cup in Germany. Surprisingly, 62% of all live viewers were male . While this does vary from country to country, it is quite significant to observe that more men are watching a women’s sporting event than women. One of the largest disparities in percentages by country is in China, where 70% of viewers were male and only 30% were female . KantarSport. 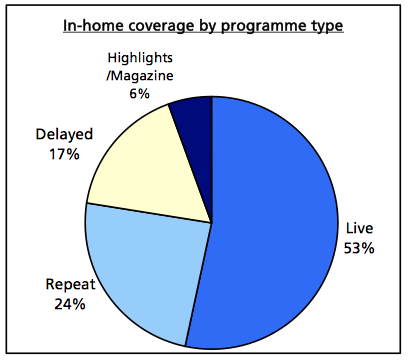 FIFA Women’s World Cup Germany 2011: Television Audience Report, n.d. Web. 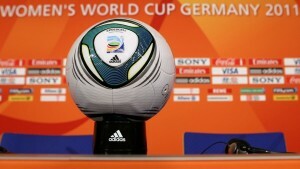 “FIFA Women’s World Cup Germany 2011.” FIFA, 20 July 2011. Web. 30 Apr. 2015. “FOX Sports Makes Unprecedented Broadcast Commitment to FIFA Women’s World Cup 2015.” FOX Sports. N.p., 16 Dec. 2014. Web. 01 May 2015.